Three men have been found guilty of shooting a seven-year-old boy and his mother in the legs in a gangland feud. Christian Hickey and his mother Jayne were shot on the doorstep of their home in Salford in October 2015. 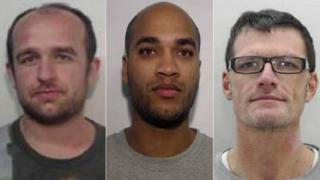 Carne Thomasson, 28, Christopher Hall, 49, and Aldaire Warmington, 32, were convicted at Manchester Crown Court of conspiracy to commit grievous bodily harm with intent. The three were cleared by a jury of conspiracy to murder. Christian and his mother were blasted in the legs with a Heckler & Koch P7 self-loading pistol as they answered the door at their house in Winton at about 21:25 GMT on 12 October, the court was told. Both were left lying in a pool of blood in the hallway of their home, with one bullet passing through Mrs Hickey's leg into her son who was standing behind her. They were the victims of a Salford organised crime gang called the A-Team which was involved in drugs, violence and extortion, jurors heard. The attack was revenge for the "execution" of Salford "Mr Big" Paul Massey, who was shot on his doorstep by a splinter faction of the gang three months earlier. During the two-month trial, jurors were told Thomasson, a drug dealer earning £5,000 a week, knocked on the door to "flush out" Christian Hickey senior, who was good friends with Michael Carroll, the leader of the faction that had split from the A-Team. Mrs Hickey answered the door to find Thomasson asking, "Is your husband in? ", the court heard. She replied "One sec" and went to close the door but a second man appeared from behind her husband's van and opened fire. Blood was left "pouring" out of her son's leg as Mrs Hickey screamed for her husband, who locked the door and dialled 999. In a recording of the call played in court, Christian Hickey is heard to say: "My son has been shot, he is only seven years old. Please send someone quickly. "My son is going white now, please hurry up. "They are conscious but my wife is losing a lot of blood. Hurry up." Thomasson and the gunman, who has not been identified, fled in a stolen Audi S3 car with false plates. Greater Manchester Police's detectives pieced together phone, vehicle movements and CCTV footage, showing Thomasson picking up the gun from Hall, the gang's armourer. Warmington had a "high level managerial role" in the A-Team, "pulling the strings" from afar and helping to arrange disposal of the car, jurors were told. James Coward, 22, Dominic Walton, 26, and Lincoln Warmington, 32, were each convicted of conspiracy to pervert the course of justice by getting rid of the stolen Audi. All eight will be sentenced at a date yet to be fixed. John Thomasson, 49, was cleared of conspiracy to murder, conspiracy to commit grievous bodily harm and perverting the course of justice.